Thanks to the helpful bike shop employee in M.C. 's hometown of Wallingford, I had one less step when I got to building the brakes. So now that I was done with Step 3, Consult an Expert I moved right along to Step 4: brakes. I had only been recently introduced to disc brakes. My 2009 Dahon Matrix came with a set, and M.C. had long assured me I'd enjoy the reliability of disc brakes over caliper. He had been right about my longtime aversion to clipless pedals (once I went to clipless in 2006 I'll never ride with anything else) so I had no reason to doubt him on disc brakes. The rotor above is 175mm, and you'll notice it has six holes in the middle for mounting to a wheel. 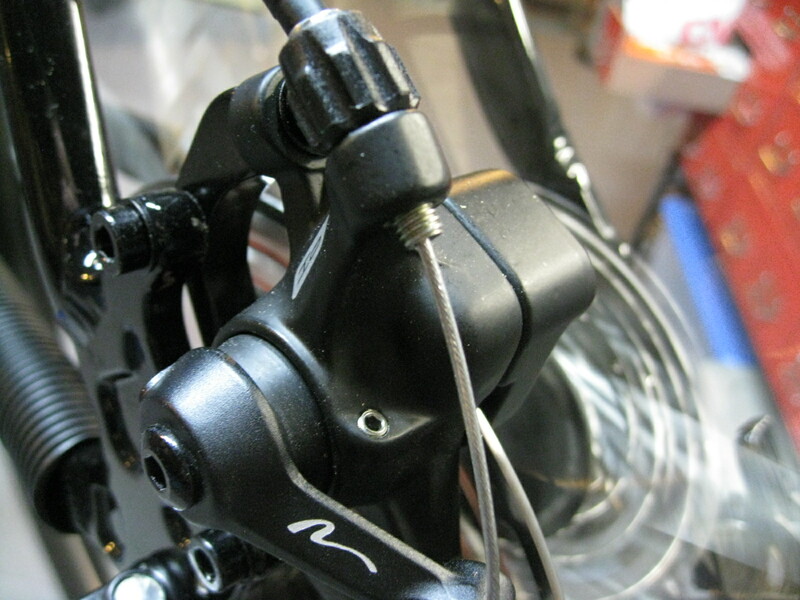 If your bike has caliper brakes you need brake mounts for the hardware AND a wheel that is set up with the six holes. Disc brakes, which are more reliable and work better in wet weather than caliper brakes, are becoming more common on mountain bikes and the prices of non-disc brake wheels are often noticably cheaper (hence the great wheels I bought for my Office Bike). Since the package was 'Not Delivered' I left the stem and handlebar from M.C. on the bike so I wouldn't run the risk of making the cables too short. When you identify which frame cable mounts are for which cables, they look rather impressive when you put them in place. For this installation I used the same kit I had used for the snow bike, which is a Nashbar Mechanical Mountain Bike Disc set. It's a decent system for the price, and don't get intimidated when you take all the parts out of the bag. It's all so simple, really: your goal is to make the bike stop when you squeeze the handle. 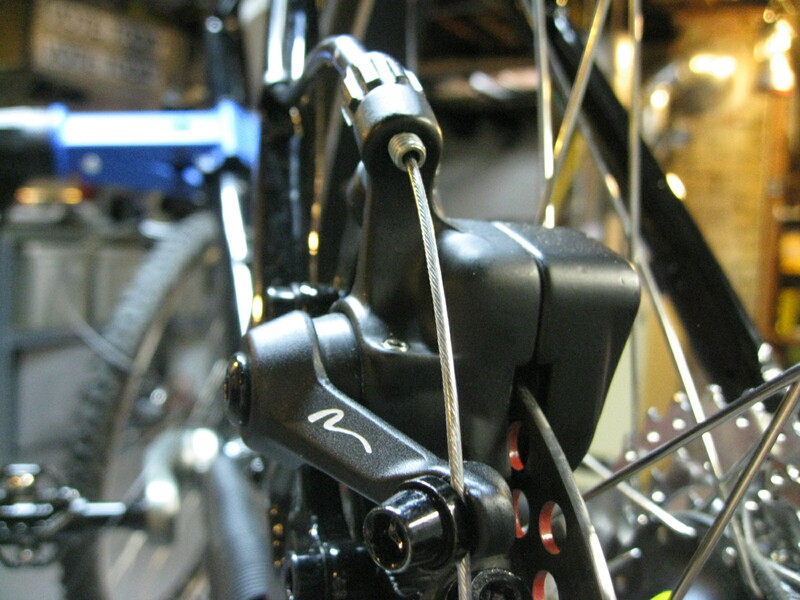 The cable pulls the brake pads toward the rotor and the wheel slows down, and stops. 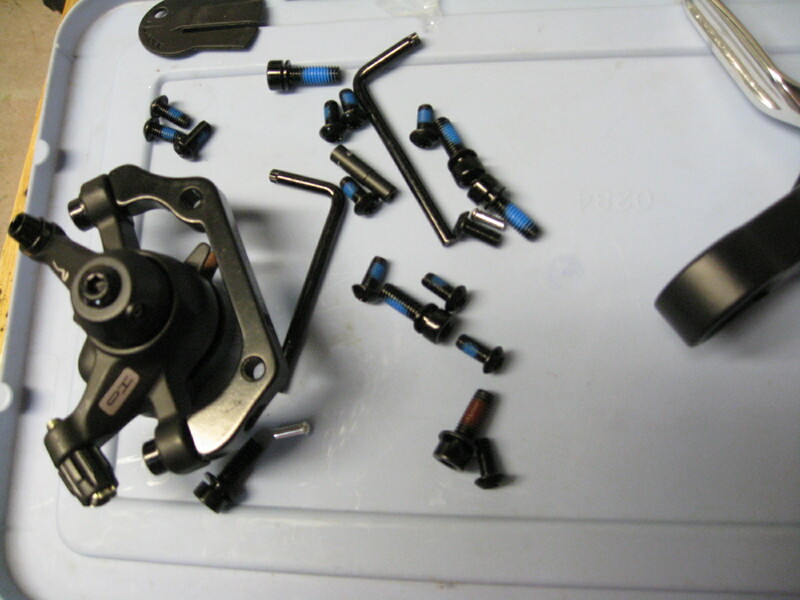 The brake kit mounts on the frame with two holes, and, as noted with the snowbike project, there is some play in the openings so you can adjust the position of the brake around the rotor. I had no need for bolt cutters with this bike frame. Unlike the snowbike, the brake went on easily, and with the levers on the stand-in handlebars, all it came to was adjustments. The little hex bolt was the most frequently adjusted bolt of the build so far. The cable needs to be taut, the rotor can't rub against the pads when your hand isn't on the brake, and the whole thing just needs to be perfect. A chain skipping on a derailleur or a bent outer chainring are all problems, but they're more of a 'nuisance' problem rather than a 'dangerous' problem. Not having brakes is a dangerous problem, so make sure you get it right. Soon enough, I did get it right on both the front wheel and the back wheel. You'll notice the wheel is spinning in this photo. I used my hand to spin the wheel as hard as I could, then I'd reach over for the brake lever and squeeze. The wheel would stop instantly. I'd spin it again and gently compress the lever, and the wheel slowed down. I did the same for the front wheel and got the same result. Finally, I spun the rear wheel as hard as I could, and while it was still spinning I spun the front wheel as well. Then, instead of squeezing the brakes, I took a few steps back in the shop and was almost taken aback by what I saw on the Park Tool PCS-9: it looked like a mountain bike. It still had no chain or shifters, but it looked the part, and the spinning wheels were making the bike move back and forth slightly on the workstand, as if it wanted to get off. It was a Batman Begins moment: everything was taking shape, coming together, and the music from Hans Zimmer was building (I may have been listening to the soundtrack at the time). 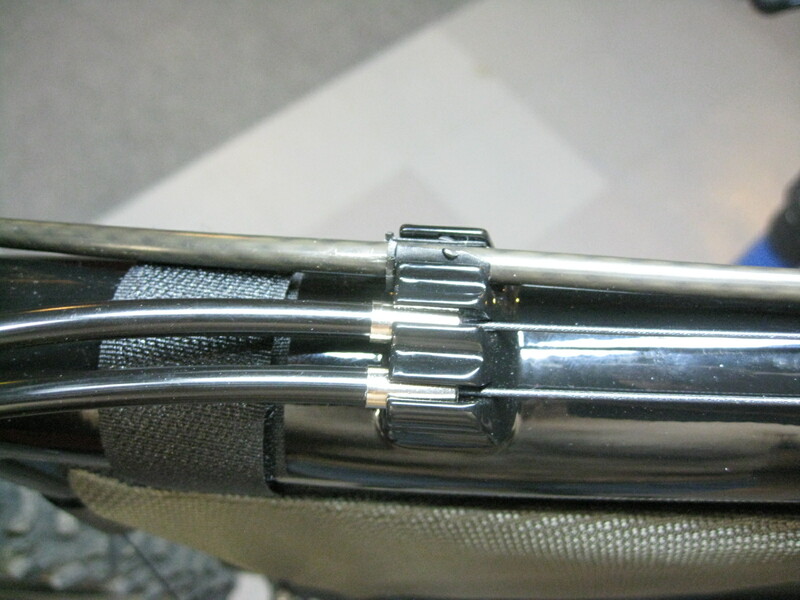 Since that, I began checking the FedEx link for the handlebars package several times a day.